From best-selling and award-winning author David Metzenthen comes a powerful new novel. Better in here, they think. Safe and sound. No shocks and no surprises. Twenty-one degrees Celsius all year round. Ryan Lanyon lives in the shadows of a shopping centre on the far side of the city. But outside Sky Point Mall, no one is safe. His brother is a bouncer. His best mate owns weapons. Ariel works in a surf-shop and has never seen the sea. And the tragedies of the past will poison the future – unless someone has the guts to cross the line. 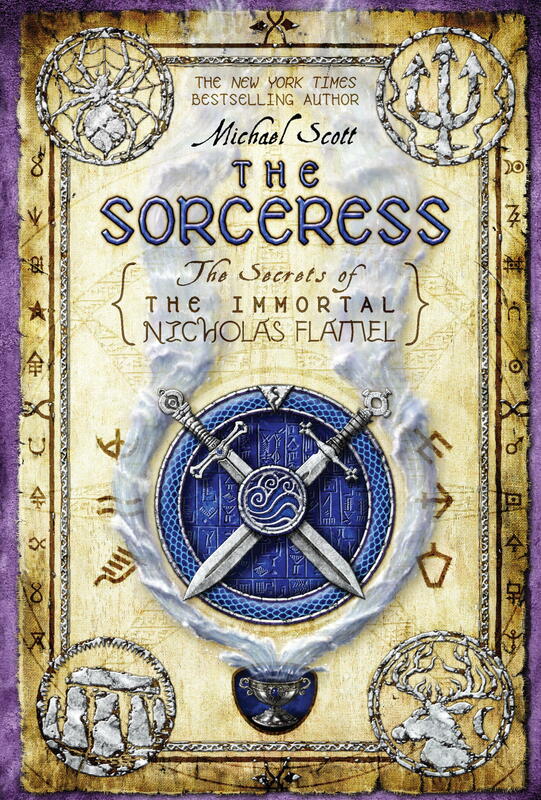 The third book in Michael Scott’s “Secrets of the Immortal Nicholas Flamel” series, The Sorceress, kicks the action up to a whole new level. Adding to the series’ menagerie of immortal humans (“humani”) and mythological beasts, the book picks up where The Magician left off: the immortal Nicholas Flamel (of The Alchemyst) and the twins, Sophie and Josh, have just arrived at St. Pancras international train station in London. Almost immediately, they’re confronted with a demonic bounty hunter that immortal magician John Dee has sent their way. At the same time, Dee’s occasional cohort, Niccolo Machiavelli, decides to focus his energy on Perenelle Flamel, the Alchemyst’s wife, who has been imprisoned at Alcatraz since the beginning of the series. In this book, Perenelle gets a chance to show off her sorcery and resourcefulness, fighting and forging alliances with ghosts, beasts, and the occasional Elder to try and find a way out of her predicament and back to Flamel. Scott is as playful as ever, introducing new immortals–famous figures from history who (surprise!) are still alive. He also adds to the roster of fantastical beasts, which already includes such intriguing foes as Bastet, the Egyptian cat goddess, and the Morrigan, or Crow Goddess. Raising the stakes with each installment, Scott deftly manages multiple story lines and keeps everything moving pretty quickly, making this third book a real page-turner. More than just another piece in the puzzle of the whole series, The Sorceress is an adventure in its own right, and will certainly leave series fans wanting more. The winners of the 2008-9 Cybils (The Children’s and YA Bloggers’ Literary Awards) have been announced. They include The Graveyard Book by Neil Gaiman and The Hunger Games by Suzanne Collins in Fantasy and Science Fiction, Rapunzel’s Revenge by Shannon and Dean Hale in Graphic Novels, and The Disreputable History of Frankie Landau-Banks by E. Lockhart in YA Fiction. For a list of all 11 winners, visit the Cybils blog. Ostensibly about a cat that turns bad when her family runs out of her favorite food, this is really a clever alphabet book for kids old enough to appreciate the way words work. It will appeal to youngsters who like their stories more naughty than nice. The work on One Beetle Too Many (Candlewick, 2009) began more than 24 years ago, according to author Kathryn Lasky. “It’s amazing that I haven’t evolved into another creature,” the author states, referring to the process of bringing her picture-book biography of Charles Darwin to fruition. In this title Lasky takes a complex theory—the theory of natural selection—and a complicated man, and makes both accessible to young readers. In many ways, the book’s seeds were planted while she was working on her very first title, Traces of Life: The Origins of Humankind (Morrow, 1989), illustrated by Whitney Powell. But the release of Beetle in 2009 was perfectly timed, coinciding with the 150th anniversary of the publication of Darwin’s On The Origin of Species. Here Lasky discusses her career-long fascination with the naturalist. Can you talk a bit about how this project evolved, if you’ll forgive a pun?